Fantastic speedway rider but an utterly dreadful human being. Way too much ego and opinion without even an average intellect with which to deliver it Traits which are sadly common in many modern day riders and promoters alike. Not sure the work on the track changes the new stadium position one iota. Internal work within the existing stadium doesn't prove Gaming International's commitment to build anything. Swindon signed him in 1983 but he had a car accident before joining and never rode. Given his record at Leicester and Hackney, he would have fitted well into our team that season!! Bit of a cheat really as he rode for Sheffield in 1993, so not in the period mentioned initially. He was pretty pants though... I always had a soft spot for Eastbourne in their early BL days as they had a conveyer-belt of untried foreigners in that period. It encapsulated so much that is wrong with British Speedway promotion. He is so far out of kilter with the the majority of issues and many of his comments were simply insular and far removed from the perspective of the sport as a whole. Based on that article, the tunnel is well and truly bricked up with not a glimmer of light to be seen! I think I'm right in saying Jensen's only point came from a Richard Hellsen engine failure. Christophe Cayre of Isle Of Wight takes that accolade for me I think. 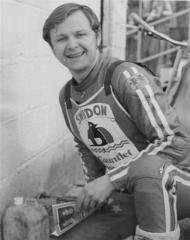 I think Claes Jensen of Poole has the record nailed for beating fewest riders, Steve. Raba was actually leading heat 8 by some distance at Bristol, before inexplicably falling off all on his own.... And I reckon he "beat" two - we can't underplay his contribution!